The Episcopal Ordination of Monsignor Wayne Joseph Kirkpatrick, Auxiliary Bishop-Elect of Toronto and Titular Bishop of Aradi took place at the Cathedral of St. Catherine of Alexandria, St. Catharines on Wednesday, July 25 at 3 p.m., the feast of St. James the Apostle. Thomas Cardinal Collins was the principal ordaining bishop, assisted by Bishop Gerard Bergie and Bishop John O’Mara. Bishop Kirkpatrick's motto is -- Abide in me. 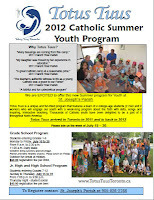 We are once again excited to offer this Archdiocesan youth program. Totus Tuus is a unique and fun-filled program that features a team of four college-age students who will engage our youth with a week long program about the faith with skits, songs and inspiring, interactive teaching. Dates for those entering Grades 1 – 6, are July 16 to 20 from 9 am to 2:30 pm, with 11:20 daily Mass. The parish will provide healthy snacks and pizza lunch on the Friday. Children must bring own lunches and a beverage the other days. Registration fee for this group is $60 per child. For those entering Grades 7 – 12, the program will run July 15 to 19 from 7:00 pm to 9:00 pm, with a student social on the Thursday night. Registration fee for the Jr and High school group is $40 per teen. To register, contact the Parish Office at 905-826-2766. See flyer on Bulletin Boards for all details or visit our website. Edge Camp Toronto 2012 from EdgeCampToronto on Vimeo. PROCESSION ON CORPUS CHRISTI following the 12:30 pm Mass Sunday, June 10th our Corpus Christi procession to St. Joseph’s Elementary school ending with Benediction there.